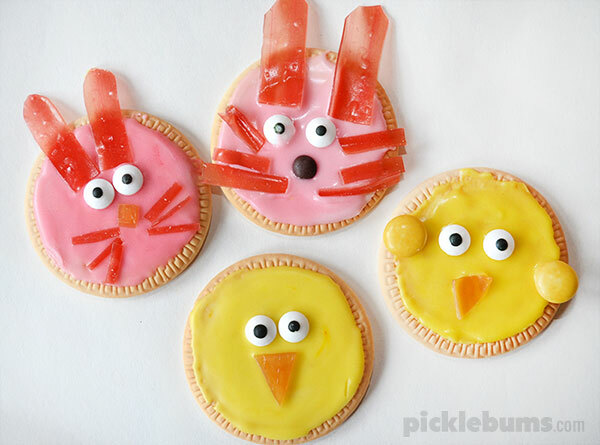 The Easiest Easter Cookies Ever! 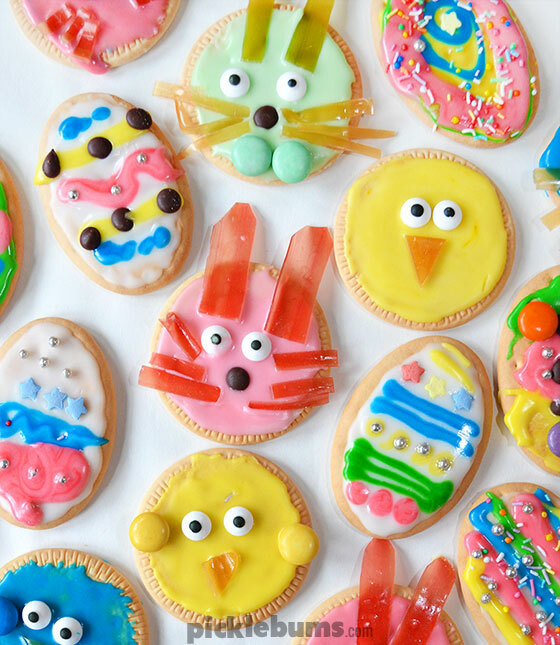 We’ve made a version of these Easter cookies/biscuits almost every year since my twins were toddlers. They are so easy, no really… they are super, really, a whole lot, easy. There is no baking or cooking of any kinds, just a bit of mixing, spreading, squeezing and sprinkling. We used shop bought cookies/biscuits – plain oval ones that are called Milk Arrowroot here, and plain round ones that are called Marie biscuits here. We made a very basic icing/frosting mix of just icing sugar (powdered sugar) and a little milk, plus colouring. We collected up a variety of sprinkles, choc chips, chocolate buttons and whatever else we had in the cupboard. Instead of fancy piping bags we just used snap lock bags with a tiny snip taken off one corner. Using a cup to hold each icing bag will catch any drips and make the whole thing easier for little hands to manage. 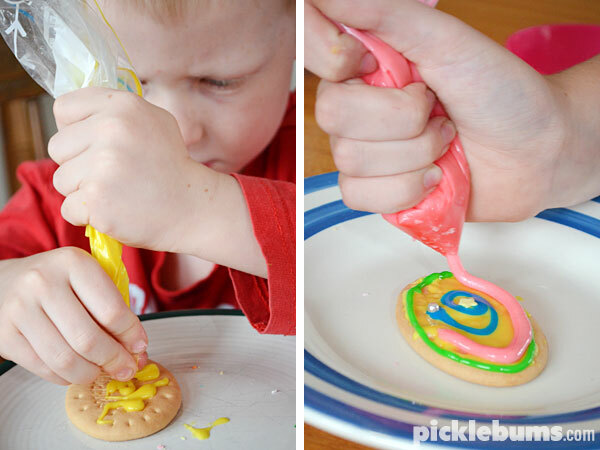 Give each child a plate to put their cookie on while they decorate it, that will keep the sticky mess a little more confined and easy to clean up. Now… go crazy and decorate! First we made some Easter egg cookies with the oval cookies. The big girls wanted to make chicks and bunnies so we the round cookies and cut the ears, whiskers and beaks from fruit roll ups using scissors. You could use fruit leather or any flat candy that you can find. We used candy eyes that we had left over from our Friday the 13th party last year, but you could also make your own eyes from choc chips, or simply use some black gel icing. Mix up the icing, keeping it fairly thick and stiff. 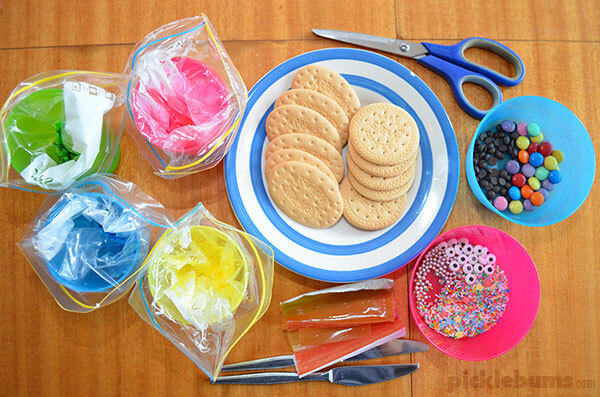 Place a zip lock bag into a cup for each colour of icing you want to make. Add a dollop of icing into each bag plus a few drops of colouring and mix. Seal the zip lock bags and cut a tiny snip of one corner to make a piping bag. Place the bag back in the cups for easy access and to catch any drips. 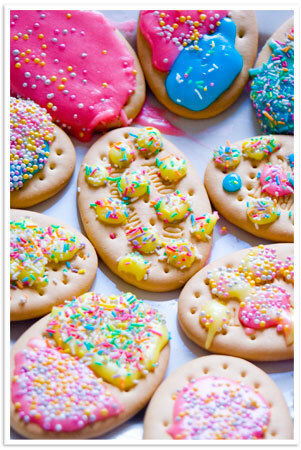 To make the egg cookies use an oval cookie and go crazy with the icing and decorations! To make the chick cookies use a round cookie and spread it with yellow icing. Place to candy eyes in the centre and cut a beak from the fruit roll up or other flat candy. To make the bunny cookies, use a round cooking and spread it with icing. Place candy eyes in the centre and a choc chip for a nose. Cut ears and whiskers from the fruit roll up or flat candy. And this is what we made the other day with two 12 year olds, an 8 year old and a 5 year olds! Kids of all ages will love squishing and squeezing the icing on to the eggs, and bigger kids will get creative cutting out bunny ears and making all kind of creations. Well, my initial reaction was going to be “HMPH!”, but then I read the ‘no cooking involved at all’, and then you really peaked my interest! Great idea! Must do some when we are next home…because we realised today that chocolate and our 3yo son spells behaviour-DISASTER! TFS! Love the icing colour. We baked chocolate brownies yesterday which is probably not what we all needed given the whole Easter egg thing this weekend! I need to find non-nasty alternatives cause there is no way that L is having anything like that. Fun and Easy! I like it! 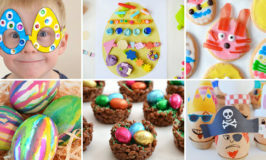 These look so fantastic and great for the kids to do over Easter. 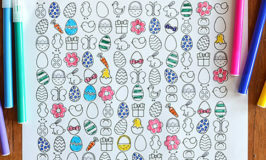 I’d love to include this in a round up I’m preparing for Easter. 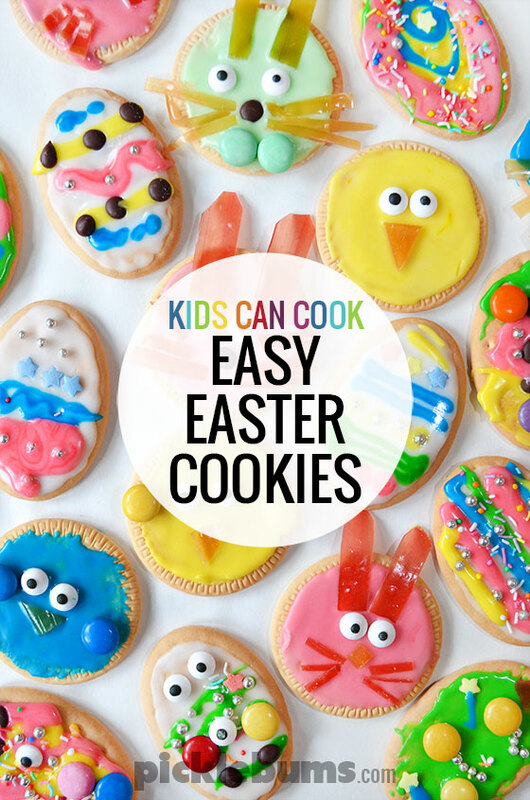 Home » The Easiest Easter Cookies Ever!